A commander may begin planning on his own initiative, based on indications and warnings, or in response to specific guidance and direction from HHQ. The planning process is designed to promote understanding among the commander, his staff, and subordinate commanders regarding the nature of a given problem and the options for solving it. The plans which result may be considered hypotheses that will be tested and refined as a result of execution and assessment. Problem framing enhances understanding of the environment and the nature of the problem. It identifies what the command must accomplish, when and where it must be done and, most importantly, why—the purpose of the operation. The purpose is articulated in the mission statement (task and purpose). The purpose of the operation, which is enduring, is restated and amplified as desired in the commander’s intent. Since no amount of subsequent planning can solve a problem insufficiently understood, problem framing is the most important step in planning. This understanding allows the commander to visualize and describe how the operation may unfold, which he articulates as his commander’s concept— his overall picture of the operation. The commander’s concept is also known as the CONOPS, operational concept, or method. As planning continues, the commander’s concept becomes more detailed, providing additional clarity and operational context. Design does not end with problem framing, because the situation constantly evolves and requires the commander to continually review and possibly modify his design. The COA development step produces options for accomplishing the mission in accordance with commander’s intent. It provides options for the commander; refines the design; and promotes understanding of the environment, problem, and the approach to solving the problem. The COA war game examines and refines the option(s) in light of adversary capabilities and potential actions/reactions as well as the characteristics peculiar to the operating environment, such as weather, terrain, culture, and non-Department of Defense (DOD) entities or stakeholders. This detailed examination of the operational environment and possible adversary reactions should forge a greater understanding of the environment, the problem, and possible solutions. During COA comparison and decision, the commander reviews the pros and cons of the option(s) and decides how he will accomplish the mission, either by approving a COA as formulated or by assimilating what has been learned into a new COA that may need to be further developed and wargamed. The orders development step translates the commander’s decision into oral/written/graphic direction sufficient to guide implementation and initiative by subordinates. The transition step may involve a wide range of briefs, drills, or rehearsals necessary to ensure a successful shift from planning to execution. A number of factors can influence how the transition step is conducted, such as echelon of command, mission complexity, and, most importantly, available time. 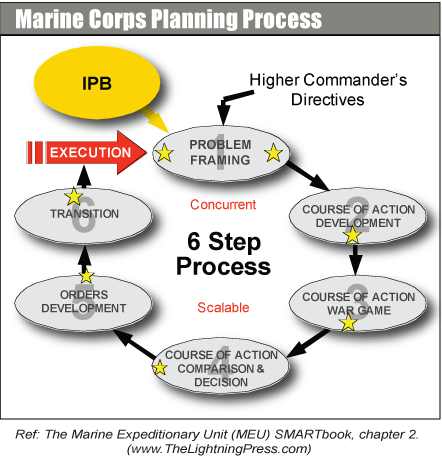 The Marine Corps doctrinal philosophy of maneuver warfare describes planning as an essential part of the broader field of command and control. The aim of command and control is to enhance the commander’s ability to make sound and timely decisions. Effective decision making requires both the situational understanding to recognize the essence of a given problem and the creative ability to devise a practical solution. Hence, an essential function of planning is to promote understanding of the problem—the difference between existing and desired conditions— and to devise ways to solve it. Planning involves elements of both art and science, combining analysis and calculation with intuition, inspiration, and creativity.